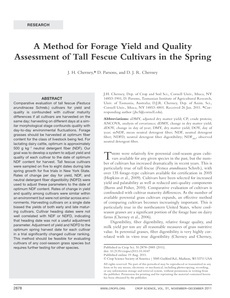 Comparative evaluation of tall fescue (Festuca arundinacea Schreb.) cultivars for yield and quality is confounded with cultivar maturity differences if all cultivars are harvested on the same day; harvesting on different days at a similar morphological stage confounds quality with day-to-day environmental fl uctuations. Forage grasses should be harvested at optimum fiber content for the class of livestock being fed. For lactating dairy cattle, optimum is approximately 500 g kg−1 neutral detergent fi ber (NDF). Our goal was to develop a system to adjust yield and quality of each cultivar to the date of optimum NDF content for harvest. Tall fescue cultivars were sampled on five to eight dates during late spring growth for fi ve trials in New York State. Rates of change per day for yield, NDF, and neutral detergent fiber digestibility (NDFD) were used to adjust these parameters to the date of optimum NDF content. Rates of change in yield and quality among cultivars were similar within an environment but were not similar across environments. Harvesting cultivars on a single date biased the yields of both early and late maturing cultivars. Cultivar heading dates were not well correlated with NDF or NDFD, indicating that heading date was not a useful adjustment parameter. Adjustment of yield and NDFD to the optimum spring harvest date for each cultivar in a trial signifi cantly changed cultivar ranking. This method should be feasible for evaluating cultivars of any cool-season grass species but requires further testing for other species.